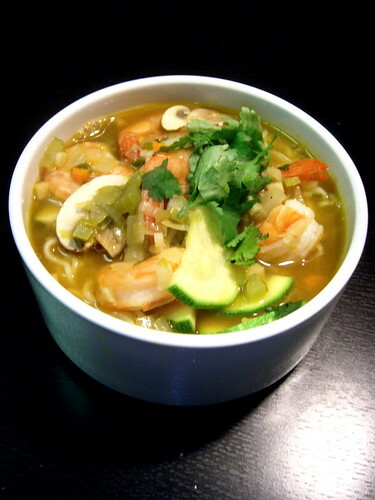 peanut butter and shrimp curly noodle soup, originally uploaded by aarn! +9th January, 2009+. made a bunoise of celery, carrots, garlic, ginger, scallions, and onion, seasoned with a little cinnamon, salt and pepper, over 1T. of butter. added vegetable stock and cooked down for 15-min or so, added 1T. of soy sauce, 1t. sesame oil, chopped baby portobello mushrooms, sliced zucchini, and uncooked shrimp, and let cook for 3-5 minutes. before serving added 1t. of white vinegar. poured the soup into a bowl containing a spoonful of peanut butter and cooked curly noodles, garnished with fresh cilantro.